HUNTINGTON, W.Va. — It would be easy to overlook an uptick in crystal meth use with the Tri-State awash in an opioid epidemic, but the rise of meth along with existing widespread heroin addiction creates a new dynamic of dangers. Law enforcement officers investigate the scene of a suspected meth lab in May in Huntington. According to data collected by the Cabell-Huntington Harm Reduction Program, roughly 20 percent of local intravenous drug users who use heroin also use crystal meth, noted Jim Johnson, director of the Huntington Mayor’s Office of Drug Control Policy. In Wayne County, one-third of all the Wayne County Sheriff’s Department’s felony drug arrests made in 2017 have been related to meth, according to department data. Of those 36 total felony drug arrests, 16 were made in April alone, several relating to meth. That is almost double the total number of arrests made in the prior five months, at a total of 60 to 70 charges issued in the arrests. “Within the past few months, we have seen an increase in the crystal and not homemade form of meth hitting the streets. It is all over, not just in the northern or southern ends of the county,” Wayne County Sheriff Rick Thompson said. Although opioids remain the major cause of alarm in Cabell and Wayne counties, as is the case across Appalachia, meth use has remained more widespread nationwide and continues to grow alongside heroin use. Between 2010 and 2015, meth use increased from 3 to 4 percent of the population, according to the Substance Abuse and Mental Health Services Administration. At the same time, heroin use shot from 1 to 2 percent of the population. While meth confiscations have risen locally over the past year, Johnson said it’s not exactly the same drug as was once common in the area. The new streams bring in a higher-grade, more expensive crystal meth driven by cartel activity through Mexico, Johnson said, citing Drug Enforcement Administration (DEA) reports, along with greater pushes by organized crime to sell heroin and fentanyl across the country. This contrasts with the homemade “shake and bake” methods produced domestically in pop bottles and bathtubs in recent years at lower grades and prices. The new problems therein lie when the two drugs are taken simultaneously – meth being a stimulant, or upper, and an opioid being a depressant, or downer. The mixture has produced strange results in overdose cases, the office reports: The victim’s upper body may show the effects of a heroin overdose, such as shallow breathing and a low heart rate, though the lower body may twitch and flail under the upper effects of meth. 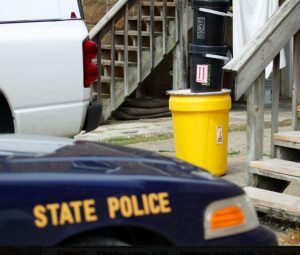 Death from a methamphetamine overdose is also different from an opioid death, reports the Stateline News Service of the Pew Charitable Trust. With opioids, which affect the part of the brain that controls breathing, high enough doses can shut down respiratory functions, quickly causing death. With methamphetamine, death is typically caused by a stroke or heart attack and is characterized by extreme sweating as the body overheats prior to death. Because methamphetamine represents a lower risk of overdose, many use it for decades, which often results in gradual organ failure and death. Those deaths are typically not counted in the overdose statistics. Although the potential for a meth overdose is significantly lower than with opioids, Stateline reported in an article published in mid-May, overdose deaths attributable to meth have spiked in the past few years. In 2015, nearly 4,900 Americans died as a result of a meth overdose, up from roughly 3,700 deaths in 2014 – a 30 percent increase in one year. Treating a meth addiction is also much more difficult compared to opioids. No FDA-approved medications exist to stop the cravings for methamphetamine, Stateline reports, whereas three effective drugs are available to help people recover from opioid addiction. Because of the increase, the Wayne County Sheriff’s Department and officers with the Wayne County Sheriff’s Drug Enforcement Unit have increased efforts to eradicate not just meth, but all drugs. This time last year, heroin dominated the headlines and still makes an impact in the community. The problem is now meth is catching up and in some cases surpassing heroin arrests. “Heroin is still here. We still respond to overdoses, and we still are making arrests. Meth just seems to be making an increase when you look at the figures and it totals a third of all your felony drug arrests since January,” Thompson said. Because of meth’s hyperactive, agitating effects as an upper, the drug tends to lead to more violent crime compared to opioid use, Johnson said, the latter generally producing more property crimes and thefts to sustain the addiction. The Wayne County Sheriff’s Department has made two armed robbery arrests that were the direct result of drug abuse, Thompson noted, adding that most arrests of those kinds are directly related to drug addiction and is something that must be prevented in Wayne County. “We have amped our efforts up to stop this problem. We are using new tactics, new surveillance equipment, different resources that have not been utilized before by the department, and most importantly, cooperation from other law enforcement agencies,” Thompson stated. The sheriff said he is pleased with the way law enforcement agencies, such as the West Virginia State Police, FBI, DEA and the U.S. Marshals CUFFED Task Force, help on drug investigations. “Unfortunately, it takes a lot of resources and cooperation with other agencies to combat the situation. There are a lot of drug task forces and municipal police forces working together to fight this, and we are all doing our best to address this issue,” Thompson said.